Nowadays, we have more and more people connected to the Internet, and many of these Internet users participate in various kinds of social interactions on the Web. Most notably, users enjoy social networking sites such as Facebook to establish their personal profile online and to keep track of what their friends are doing. As a result, huge volumes of data of social interactions can be collected much more easily nowadays. 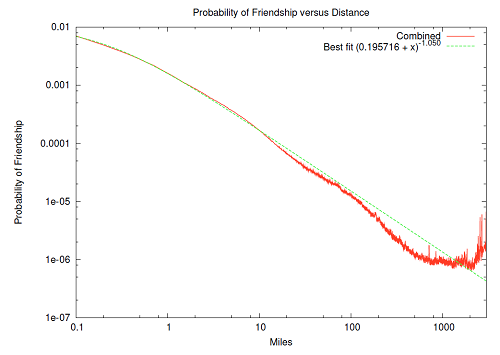 Analyzing this data can give insight into how different factors such as location, distance and friendship influence the way people interact with each other. The currently largest online social networking site is Facebook. It claims to have a community of more than 500 million registered users, and it is ranked second in terms of Internet traffic. To serve this large number of users and to keep track of all the user activities, Facebook is said to have been running more than 60,000 servers. Of course, this result seems to be quite obvious and intuitive. But still it is interesting that data from a social networking site can be used to show such a characteristic of population density. 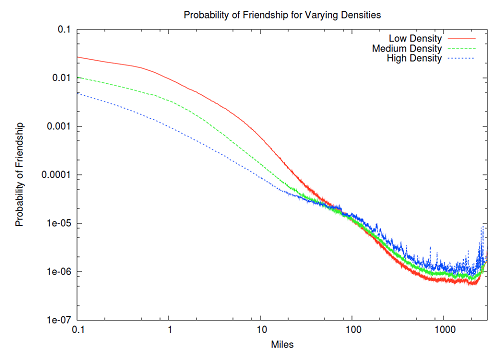 What is more interesting is that when the authors break down the users into different groups according to the population density of the areas in which they live, they find out that the probability distribution of friendship is different for different groups of users. For users living in low density areas, they are more likely to have friends within a short distance — seems like people in rural areas ‘stick together’. 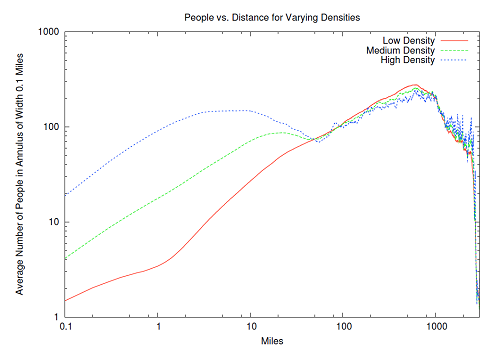 On the other hand, users living in high density areas are slightly more likely to have friends living far away. The authors suggest that this may be because that ‘people living in metropolitan areas are more cosmopolitan’. Sometimes 'keeping it simple, stupid' will not work that well. The solution to this problem suggested by the author is to assume that a user would always co-locate with one of his/her friends. 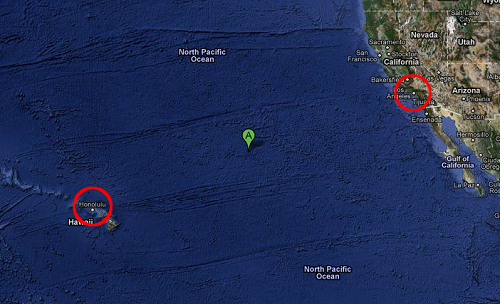 In this way the number of points that have to be evaluated becomes much smaller (i.e. the search space becomes much smaller). The paper presents some experiments and shows that this method of predicting the location of a user — while still being only a rough estimation — is more accurate than the current ‘standard’ of using the IP addresses of the users for deducing location information. In fact, some other studies have also arrived in similar conclusions. For example, a group of researchers from Northwestern University have studied user logs from a popular massively multi-player online game (MMOG), EverQuest II (Huang et al. 2009). The researchers found that although players can meet other players from all over the world in the game, and that homophily (similarity in certain characteristics) has certain influence on user behaviour, players are still more likely to interact with others who are geographically close to themselves, especially when the interaction involves partnership and collaboration in the game. Frances Cairncross first wrote about the ‘death of distance‘ more than a decade ago. However, even now when people can connect to the Internet wherever they want, geographical proximity still seems to play an important role in determining with whom people interact with. Is this a barrier that even the Internet and the World Wide Web are not able to remove? Or is that there is still relatively little benefits for people to interact with someone far away? These would be interesting questions for both computer scientists and social scientists in the future. This blog post was filed under Research, Social Networks and tagged data mining, density, distance, facebook, friendship, geo, geolocation, location, population, research, social network, study. Thank you for the sharing. It is a really interesting study!